No refundable on the booking fee if cancelled or no show. If the group do arrive but there still a reduction of the number of guests the total of the booking will be charged. The following group types are not accepted by this hostel: Junior / Primary School, Cultural Group If you have misrepresented the type of group you are booking for, your booking may be cancelled by the hostel." The 70% of the booking must be defrayed beforehand. The 30% left must be paid at the check in moment. 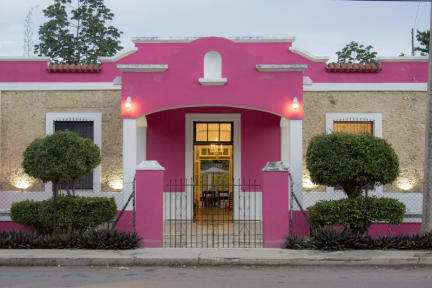 It is a typical Mexican classic hostel recently refurbished that allows visitors to be hosted in one of the most calmed and cultural rich neighborhoods of the city. 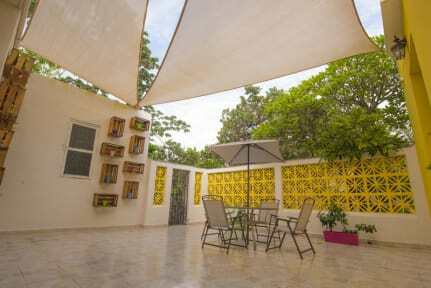 It is a small and very comfortable hostel for young people whom likes to travel and visit all the wonders we have in Yucatan. You will start your day with an energetic breakfast and be ready to be amazed by Mexican-Mayan culture. You will stay next to Paseo Montejo (300 m) and 5 minutes by bus from the city center. Also there are many restaurants, clubs, bars and supermarkets next to the property and the ADO bus stop is 500 m from us. In this sense, from our facilities you can reach some of the most important attractions of Merida such as Paseo de Montejo, Mansión de la Alcalá Martín and Palacio Canton, amongst other interesting spots of our city. We have 3 big rooms with 18 beds in total, all mixed dormitories because we like to enjoy meeting people and having a good time. We will share common areas like TV room, futbolito (table football), living room and terrace.